If at any time you need a staff member in-game or in Discord, please respect the order or ranking for the nature of your issue. All types of Mods work in-game to regulate rules. Admins work behind the scenes with the community, plugins, and improving the server, but can also regulate in-game if needed. Please, do not ask “Admin! Admin!” in-game for something like a simple question, or something outlined in these rules – it’s why we have them posted and a team of Moderators to enforce them! Semi-RP is a combination of Role-Play and Player versus Player. There are designated safe zones for the community to buy, sell and trade with one another. Residential communities and shops within the Safe Zone are protected from all outside damage, raids, etc. Once you venture outside the Safe Zone, there are zombies and other players you must defend yourself from. Each Role has specific benefits in what they can buy and sell. Live a life of crime and theft to earn enough money and purchase property in the exclusive Safe Zones to rest in peace after a hard day’s hustle. /rules – The most important command of them all! /p – Shows all permission you have in-game, including your current Role permissions and Kits available. /roles – Shows all roles! /role (RoleName) – Changes player to the named role. Do this again to change role! /roleguide – Open our guide to Roles! /kits – Shows all available kits! /kit (name) – Summons kit! /tpa name – Send a TPA to a player! /tpa accept – Accept a TPA sent to you (type /tpa a to do it quickly)! /tpa deny – Refuse a TPA from a player! /tpa abort – Stop a current TPA you have sent! /home – Teleports player to their bed (must have a claimed bed or cot)! /buy ID – Buy and Item. You can use “quotes” if using the item’s name such as /buy “Desert Falcon” or use /buy 488! /sell ID – Sell and Item. You can use “quotes” if using the item’s name such as /sell “Desert Falcon” or use /sell 488! /cost ID – Check the cost before you buy! /costv ID – Check a vehicle’s cost before you buy! /discord – Join our discord! /balance – Show’s players current credit balance of in-game money for /buy, /sell, and to barter with other players! /staff – Apply for staff! /rlist – Lists the Safe Zones! /rteleport LocationName – Teleports you to the named region! /vault – Basic vault for all players. /vault member – Upgraded vault available to all Safe Zone members. Do not disrespect players and staff members. Breaking this rule will result in a permanent ban. Do not cause unwanted or unneeded drama. Do not troll, harass, stalk, or purposely annoy players – take it to the PvP zone if you have an issue to settle. World chat is for gameplay chat only. Please Speak English. Please do not advertise, talk about religion / sensitive topics, or have personal conversations in the World Chat. Use a third party voice or chat channel or group chat. Don’t spam. I mean, c’mon. Do not spam TPA players, especially staff members. Dont ask staff for items or weapons. The player community is the source of trade and commerce, not staff. Messaging in all capitals is not allowed, it is a kickable offense (bannable if repeated). Glitching under or above the map will not be tolerated and you will be banned. Our staff do not use the the duty plugin to go on/off duty. Do not place items on the roads or bridges that will block traffic. Vehicels in roads will be destroyed by staff. We do not require, but highly prefer, than players match their in-game name to their Discord name, if they become active in the community. This helps staff identify who we are speaking with if we are working on an in-game situation. 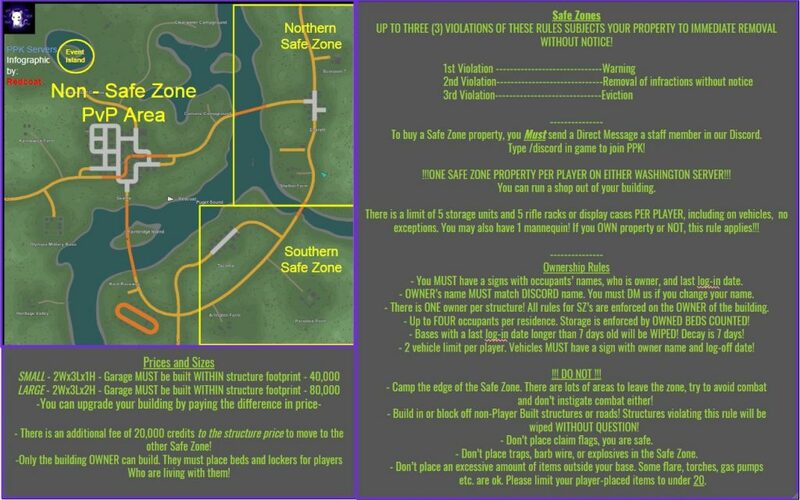 However, if you own property in a designated Safe Zone, matching Discord name to in-game is REQUIRED. Group limit of 4 players! There may not be more than 3 staff members on one team. Do not attack players in Safe Zones if they are on your team! It confuses staff and annoys players around you or makes them jumpy. Plus, you are punching/harassing in a SZ, that’s against the rules too! Groups may live in bases together as long as the bed and storage limit per building is not abused. Vehicles – INSIDE SAFE ZONES – Outside of a safe zone, these rules DO NOT APPLY! Steelie Wheelies are BLACKLISTED. Vehicles will AUTOMATICALLY unlock if not occupied for 3 days; 259,200 seconds! Socket wrenches are also blacklisted. A player may own up to 2 vehicles. It is your choice if it is 2 land, 2 air, 2 sea or a combination of them. You must have a sign with the owner’s name and last log-off date on your vehicles. It prevents theft and helps staff see that they are not random or abandoned. Using a carjack on a vehicle that is not yours is considered griefing unless you are asked to help out by the owner or they are present. Staff may jump on you if not. The Limit on storage counts for vehicles too! And is shared! meaning if you have 2 of your 5 in your base, you may only have up to the other 3 of your 5 on your vehicle! When outside the SafeZone, Killing on Sight (KoS) and Random Death Matches (RDM) are legal! Shooting at players, griefing, punching, harassing, or any form of taunting or attempt to kill inside the Safe Zone may result in ban time. Players seek refuge in the Safe Zones for re-arming and gear checks, don’t harass them. Take it outside! Do not block off areas of land or resources that players will use! Ex: Do Not build a curtain wall around the gas station/gas tanks that players will need to fill up vehicles. Floating structures are not allowed. All barricades and structures must abide by the law of physics. All bases must have four pillars supporting it. The maximum size for a BASE is 2(width) x 3(length) x 2(height) and has a storage limit of lockers/vaults/units/etc (anything that holds items) of 5 PER PLAYER, and 5 racks or display cases. Do NOT build bases within +/-50 meters in-game of a Safe Zone! This counts as camping/lingering around a SafeZone. Blocking off any of the map’s bridges (Not player-made bridges). Blocking off any of the map’s islands (Not player-made islands). And do not block off anything that’s not yours, such as another players home or vehicle. Players who place plates over doors they don’t own will be /checkowner’d and BANNED. Rules are strictly enforced within RP towns! They are areas for peaceful play!!!!! Breaking rules in Safe Zones will lead to a swift ban or being evicted if you own property! YOU MUST HAVE SIGN STATING OWNERSHIP AND LAST LOG OFF TIME! Failure to have a sign present will result in a base wipe if you do not respond to us within 24 hours in Discord! Building rights in the Safe Zones are of VERY high demand. If you do not maintain it well, or have not logged on in 7 days, it will be WIPED and your property rights (40 per zone) can be sold to another player. There is NO robbing, raiding or killing in RP towns – they are safe Role-Play zones. So beware when you leave their safety! Do Not place claim flags! Only owners have the ability to build by being added to the owner’s group and it will prevent your peaceful neighbors from building within their property. You are in a no-raid zone protected by coding, don’t worry about it. 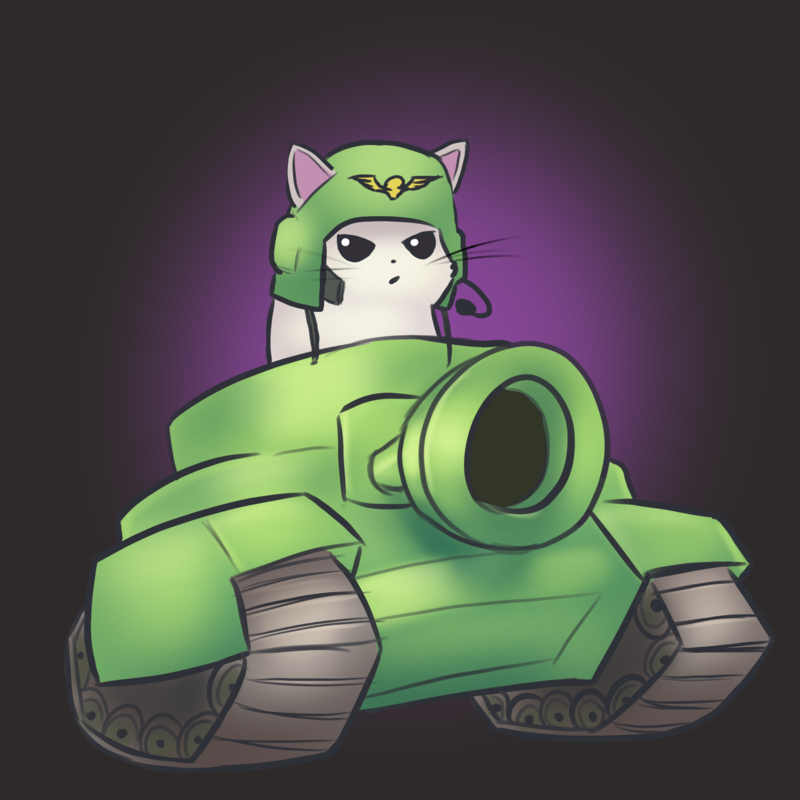 You MUST be in the Pew Pew Kittens Discord channel and MATCH your in-game name to your discord name or your property is subject to IMMEDIATE removal. This is so we can contact you if needed for any news about town changes or an issue with your property. You must DM Redcoat or Garret for the North, and Snarfield or Genocidal for the South to set up purchasing a property. DM the person you bought property from if you change your name so we can update the document! Park vehicles inside garages or around the back/sides of property. Please do not clutter the streets/prevent others from driving on them. Do Not place traps or barricade structures that deal damage outside of your base. If the owner of a building WITHIN the Safe Zone asks you to leave in voice chat or in-game chat, you MUST vacate under penalty of ban time. You can’t be killed because it is a safe zone, don’t abuse it! Do Not use sentries INSIDE the Safe Zone, they won’t be able to kill anyone and they will be obnoxious. Outside the Safe Zone you may use any kind you wish. Do Not camp the outside of a Safe Zone waiting for players to leave. After a warning, this will result in a ban! Players inside the zone cannot shoot out, and players outside the zone cannot kill those within. It is coded this way. Do not linger around or taunt players. Try to get 50 +/- meters away from town before engaging in combat. Players may have 5 rifle racks per player in their base. Don’t build in, around, or block off Non-Player built structures. We can’t say this enough…. people need to loot for the RP aspect of the server. Don’t do it. You’re annoying. When not dealing with a staff-duty situation, you must be off-duty. You may staff on duty as long as you don’t take part in active RP/PvP game play. EX: Picking up items, making structures, buying items for personal use. And more, Please also avoid being in the public! If not clearly doing a staff activity, like a sit, and you become involved in an RP situation. You must either comply or pay the robber/raider 3000 credits for the mistake! Same goes for accidentally being in God-Mode during PvP play. You must pay 3000 credits to the person who shot at you, or to EACH PERSON YOU KILL! Staff members do their best to understand the situation. Please refrain from yelling in voice chat when we try to speak to those involved. Yelling and making it harder for us will only make the other side’s case stronger when you act poorly. No staff-member is above the rules. Staff members must follow all rules. Failing to do so will result in an instant demotion. Do not use your staff-rank to gain an advantage in any situation. Staff may remain on duty within the safe zone to regularly assist players and give advice, etc. However, do not barter or trade / act as a player if on duty. Staff may NOT engage in PvP while on duty!